YALE (US)—The number of caregivers placing infants on their backs for sleep has reached a plateau in the last five years, a new study finds. 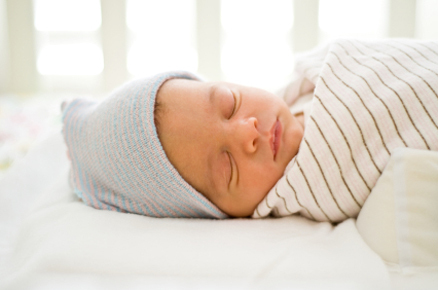 Published in the December issue of the Archives of Pediatric and Adolescent Medicine, the study is based on data from the National Infant Sleep Position Study, an annual telephone survey of about 1,000 households with infants. Putting babies on their backs helps reduce the risk of Sudden Infant Death Syndrome (SIDS). A team from Yale University tracked behavior change after the “Back to Sleep” campaign was initiated in 1994. “We looked at the behavior of 15,000 caregivers over the last 15 years and found that, although there was an increase in caregivers following the guidelines, in the last five years, the number of people putting babies on their back to sleep has leveled off,” says lead author Eve Colson, associate professor of pediatrics at Yale School of Medicine. Even more important than race, however, Colson and her team identified three key factors linked to whether caregivers place infants on their backs to sleep: whether the caregiver received a physician’s recommendation to place the baby only on the back for sleep, fear that the infant might choke, and concerns for the infant’s comfort. “If we can teach people that comfort and choking are not issues and if we can make sure that doctors advise their patients that the back is the only safe position for infant sleep, then we may be able to overcome this leveling-off of the practice that we have seen over the last five years,” she says. Researchers from Boston University, the University of Texas Southwestern Medical Center at Dallas, and the Massachusetts Department of Health contributed to the study, which was supported by the National Institute of Child Health and Human Development.